Against Raising the Debt Ceiling: What are they thinking? Now that the crisis regarding chemical weapons has been resolved in Syria, for the moment at least, let’s turn our attention to what many see as a potential crisis here at home, a failure of Congress to agree to raise the debt ceiling. We have witnessed these struggles before and eventually the debt ceiling was raised in each case, but in 2011 the dysfunction prompted a lowering of our credit rating and a tumble in the stock market before an agreement was reached. This year a Republican minority of Tea Party hardliners appear willing to take the issue to the limit. Ted Cruz and a few others in the Senate and more in the House appear to think either Obama will blink or they are willing to chance whatever disruptions in the world economy that a failure to raise the debt ceiling might prompt. What Capehart doesn’t acknowledge is that most of these people are sure they do know. What disturbs me is that the Tea Party types seem to be voicing the anger and frustration of many Americans who are looking for a simple answer to our complex problems. That simple answer is to cut government spending. The simplicity of that “solution” makes it very powerful. Positive plans tend to be complex which give rise to disagreements (Obamacare being a maximum example) which undermines action. But lots of people can coalesce around “just say no” and if that poll can be believed, that is what is happening now. If one argues that the debt ceiling being raised simply allows the federal government to pay bills it has already accrued, that it isn’t raising government spending, T. P. types might counter: Yes, but how are we ever going to get spending under control unless we can turn around the trend and here is where we are going to dig in to do it. And if told: “Any default on the nation’s debts could be calamitous for the U.S. economy. A default would rock Wall Street and hurt businesses and families by fueling a sharp increase in interest rates.”(Reuters). They simply don’t seem to believe it. Or, at least they believe that Obama would not let that happen. It is like a game of chicken for them. And their idea of guts is to not blink first. 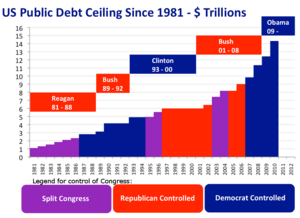 If one points out that since 1940, Congress has effectively approved 79 increases to the debt ceiling, the reaction would be, well, that’s been the problem all a long. If they hadn’t done that we wouldn’t be facing our current problems. That the federal government has always functioned with a deficit from its inception, but our economy has continued to expand despite periodic set backs suggesting our key problem now is an economy that is barely growing and not the debt we have at the moment… well, this starts sounding too egg heady for most Tea Party types, and wasn’t it the eggheads in government and Wall Street, the supposedly really smart people, who got us into this Great Recession to begin with? So, you can see the line of thinking here. And, according to that one poll, it seems to be gaining momentum. (*1) It all reminds me of something H. L. Mencken once wrote, which I’ll paraphrase as: For every complex problem there is a simple solution. And it’s wrong. So, if 62% of Americans see failing to raise the debt ceiling would produce major problems or worse, how many of the 44% who don’t want to raise the ceiling accept major problems as the cost of bringing the government to heel? Your guess is as good as mine. The former KGB thug now the second coming of Gandhi? It was just plain weird leaving me wondering who really wrote the column. It seemed so well crafted for an American audience. Like a product of an American PR firm. Or could Edward Snowden have helped out? In any event, over the last two days Secretary Kerry and the Russian Foreign Minister Lavrov, accompanied by large staffs, have hurriedly been thrown together in Geneva, Switzerland to see if the initial steps of a plan to eliminate the chemical stock piles in Syria could be worked out. If you have listened to or read any news reports you know the path forward is labyrinthian for several reasons, starting with Russia’s apparent unwillingness to put some “teeth” into a proposal that would force Assad to comply. Even if they could work that out, there is the Rubiks Cube-like logistical issue of removing chemical weapons from numerous sites in the midst of a civil war. To begin with, there are reports that Syrian troops are dispersing some of these weapons to sites harder to hit from the air, which is not a good faith effort to say the least. It is hard NOT to believe this is a Russian maneuver to both buy time for the Assad regime while rubbing our noses in our own disjointed policy. But what if Putin actually wants the securing of these chemical weapons to take place as much as we do? There are many reports that he shares with us a fear of those chemical weapons getting into the hands of Muslim extremists of which he has his share in the southern parts of Russia. If somehow the chemicals could be removed while Assad be kept in power, that would seem his preference. And given our own fears of Muslim extremists among the various rebel groups, the Obama government seems in no hurry to topple Assad. They have even been slow in giving small arms to their rebels of choice – the Free Syrian Army. It could be a dirty deal for the rebels, but it still might work to get rid of the chemicals and perhaps in time Assad, too. It is not like he is Putin’s brother. He simply suits Putin’s interests at the moment. 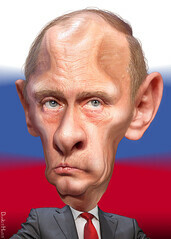 A second factor is Putin’s extraordinary vanity which has been allowed to flourish in recent days. Have you seen photos through the years of Putin’s manly, often bare chested displays, usually catching, wrestling or killing something? He believes he is the most interesting man in the world, not that guy in the beer commercial. Putin has long resented the fact that Russia is no longer a super power, which means he never gets top billing. Maybe he is tired of always playing the spoiler, a character actor rather than the lead. Over the past few days he has had the leading role in world events and I imagine he has loved it. But he has also put his own reputation on the line by implying he could solve this chemical weapons crisis himself. If things don’t work out, he regresses to second fiddle again. What would be more pleasing to his ego than to become known as the peacemaker of Syria? Every actor loves playing a role contrary to type. What accolades he would garner! Maybe even a Nobel Peace Prize. He would have a better claim on one than Obama did, and what would he love more than that? Syria: To Strike or Not or Do Something Completely Different? (NOTE: i wrote the post below yesterday in preparation for the President’s address to the nation tonight. Then news broke suggesting an alternative to strike-or-not-strike was a possibility. Amazing on the surface, it went something like this. In a news conference in Britain, Secretary of State John Kerry was asked if there might be a way out of this dilemma. He said in an off hand manner if the Assad regime allowed his chemical weapons to be secured by the international community, that could prevent a strike. Congress is split on the issue of making retaliatory strikes on the Assad regime for its apparent use of chemical weapons and, unlike its run-of-the-mill gridlock, the disagreements are not predominantly along party lines. More so in the House than the Senate, but the overwhelming vote in both parties at the moment lies in the undecided or leaning-against camps. Even though I am in favor of strikes as indicated in my previous post, I like the sense that there is actually democracy at work here. If strikes are rejected in Congress it will feel like an expression of the will of the American people, something that often seems unrelated to congressional action these days. Even though Obama went to Congress on second thought after the Parliament nixed British backing of strikes, this is a matter that could harbor huge ramifications impacting us all. We all have skin in this game. We just don’t know how much. The Middle East has become more a powder keg than ever as the age of despots is passing while experiments with democratic principles are far from replacing the stability the dictators provided in the region. Mostly just the reverse… Syria is the present poster child of the new disorder. Tonight President Obama will address the nation to make his case and it better be a good one for us to come together behind him. In attempting to thread the needle, so as to find a consensus, administration statements have become satirized as “the Goldilocks strike” implying not too hot and not to cold, just right. As Congress debates and arms are twisted this week in search of votes in favor or against, the key question will be: Will a strike make a bad situation worse or better? (*1) Tied to that is the law of unintended consequences multiplied by burgeoning chaos, which makes the arguments of better or worse particularly dicey. And better-or-worse is not just matter of Syrian well being but that of the stability of the entire region. There is the debatable question of what striking or not striking will do to American credibility. 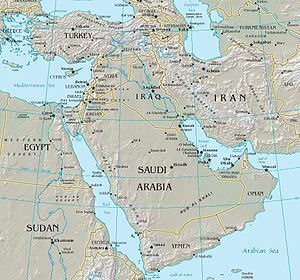 And there are likely important issues that have not surfaced yet, as well as one issue which seems to surface more each day: What is the overall U. S. strategy for dealing with the ongoing eruptions in the Middle East? Syria is often characterized as a “proxy war” between Shia and Sunni dominated Muslim states in the Middle East, suggesting the entire region is a tinderbox and Syria a match. (*1) Of course, it may actually be the second key question, the first being: How will this affect my chances for reelection? (*2) President Wilson might be the closest as he was instrumental in developing a League of Nations after WW I, but while the league came into being, the U. S. Senate blocked America’s joining. President Washington came close to being undermined by Congress when, through his Secretary of State, a treaty was shaped with England to avoid a second war with conditions deemed humiliating by the likes of fellow Virginians Jefferson and Madison. The treaty was passed narrowly in the House because Washington was “….the one man who outweighs them all in influence over all the people.”…. in the words of Jefferson. Just in case anyone who has read my last two posts regarding Syria thinks I do not have qualms about U. S. military strikes in response to the avowed “red line” being crossed regarding chemical weapons, I assure you I do. I have plenty of qualms. Fortunately, the keys ones have been expressed well in a short column by Matt Miller in the Washington Post, saving me time and effort by just linking you to them above. ” … Syria is a reminder of how utterly unique the United States’ role remains in the world. Canadians aren’t demanding that Canada’s leaders step up and stop Assad. Swedes don’t see themselves as having a duty to enforce international law. It’s obvious but worth remembering at this moment that the power of the United States is extraordinary. As a result, so is the responsibility of the person who wins the brass ring. Our President made a definitive statement about the use of chemical weapons at a time when it seemed a reasonable statement to make, given international condemnation of their use. As a result I believe some response must be made or our stature in the world will be diminished. Our “word” will be tarnished. How significantly, who knows? Each nation will draw its own conclusions. Columnist Kathleen Parker, whose opinion I respect, believes this loss overrated. I do not believe our “credibility is beyond reproach” in the eyes of our allies and as to our acting “decisively when the stakes are clear” I would point out how murky are the stakes in the Middle East these days. It is all a very messy business, so if we wait for clear stakes to crystalize, we might wait forever. I believe our habitually gridlocked government has hurt our credibility abroad, with another example of that coming up soon in terms of raising the debt ceiling, which used to be fairly formulaic as it is necessary to pay government bills already accrued. Now the world has to wait once again to see if we avoid the folly of turning the world’s number one economic power into a deadbeat. I believe other nations have doubts about our capacity to come together to do anything. I realize I am in the minority, but I would like to see us come together on this issue, supporting the President in limited strikes, a demonstration to the world that we can work together and do what “we” say we will do. As indicated in my previous post, I expected American missiles to have smashed parts of Syria by now, but the President wisely back peddled and drew Congress into the mix. The idea light might have popped on when the British Parliament voted against British involvement. Given their traditional staunchest ally role, if we can’t even get them to back us……? Or perhaps it was the poll suggesting only 28% of us or so think his proposed action seems a good idea. Or maybe Obama recalled his rhetoric before his first election which was spiced with talk of government transparency, which hasn’t been the case, and of opening debate in Congress to our use of force in the world, which has not been the case, either. Our nation has carried on an essentially hidden war using drones against terrorists in lightly populated, primitive areas around the world, so it gets little attention. It seems to be working and most of us are happy to watch so-called reality TV than focus on unpleasant realities like drones killing mostly bad guys with some unfortunate not guilty ones collateralized, just happy to hope the government is doing it in the right way, an usual trusting of our government. Anyway, if you think about this, it is nice to see a President come to Congress and actually ask their permission to attack someone. Congress are the ones supposedly in the position to declare war, but administrations since WW II have worked around them by claiming presidential power for military engagements deemed necessary to national defense. The skeptics will all criticize Obama for not being clear enough about our objectives, Allow me to help. Our general objective is to somehow remove Assad without having forces even more dangerous to us and the region take control of the government. So, we will use this “red line” as an excuse to degrade his forces, but not topple him too quickly. We fear chaos more than him. Instead, we will continue to try to slowly weaken him and bolster elements of the rebels that seem less dangerous than he is and the other rebels vying for control. As to exactly how this will play out, nobody has a clue. If a fourth military intervention (in the Muslim world) is coming, it will not be to decisively alter events, which we cannot do, in a nation vital to U.S. interests, which Syria is not. Rather, its purpose will be to rescue Obama from his words. But I would defend the president in this way. Unlike Russia, America has a set of democratic values that come into play in our foreign policy. 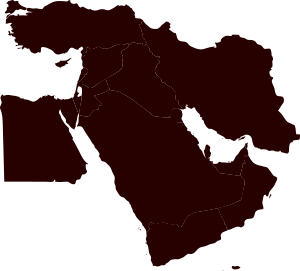 I would say they have usually taken a back seat to our desire for regional stability, especially in the oil rich Middle East, but the tension exists and has become accentuated since the launching of what was called the Arab spring, but now seems more like a burgeoning Muslim chaos. The point is the era of despots has been collapsing in the Middle East and democracy isn’t a cure all for poverty and lack of justice, especially when democracy is more a vision than something that has been practiced before the revolution, practiced for years as was the case with us. In short, there is no quick and easy transition from despotism to democracy, but don’t expect the needed patience from people throughout the Middle East who, having discarded despots, conceive of freedom as suddenly promoting a better life. We are all still getting accustomed to an Arab spring that has given way to more chaos than democracy and there are no simple answers to this dilemma.